This intelligent robot cleaner uses advanced intelligent program control, saving time and effort. 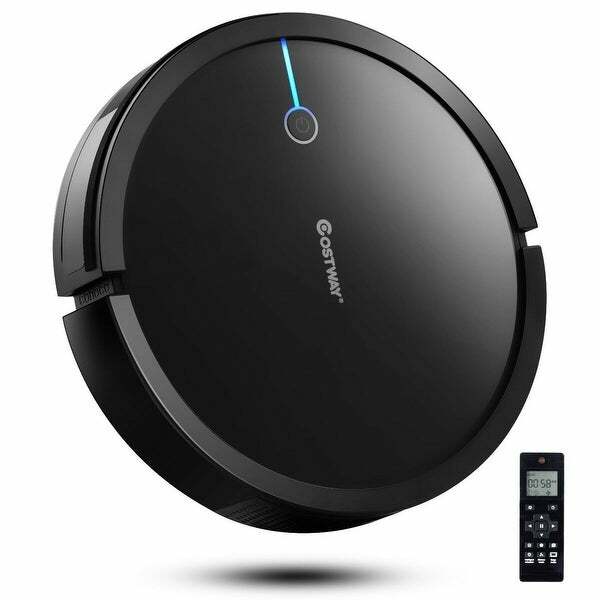 This sweeping robot combines sweeping and dragging features for working on floors and carpets And it has super suction at the same time has a variety of cleaning methods: automatic cleaning, Spot cleaning, edge cleaning, silence cleaning, intensive cleaning, to give you a clean and comfortable environment. More, smart chip control can seamlessly navigate from room to room for cleaning without missing out on your home. With intelligent IR receivers and front-end soft bumper protection not only drives robots around obstacles but also better protects furniture. 65db low noise, give you a quiet environment. Also, automatic recharge and appointment cleaning function, more convenient. It��s the perfect gift for yourself or the people you love to free them from the tired cleaning. Super strong suction, , can easily pick up pet hair, dusty. Slim design make it suitable work on hard-to-reach areas. 0.75L large dust bin holds more dirt per clean to reduce the frequency of emptying.